The Ross Revenge, like most other ships her size, was equipped with a fire extinguishant system (a C02 battery) which could manually be deployed if the ships critical equipment caught fire. 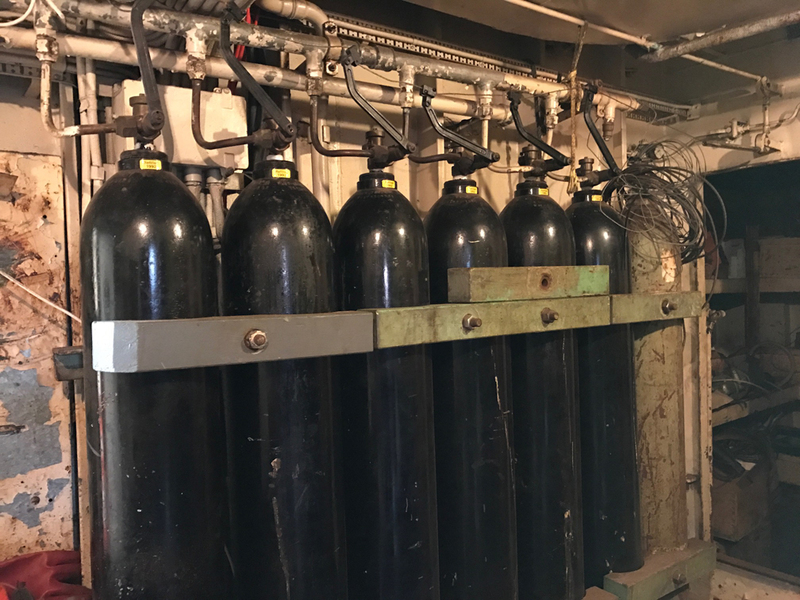 Located on main deck level in the Winch Room, the CO2 battery served the engine room Shaft Generator and Main Electrical DC Panel. As you can see from the photo opposite the six C02 cylinders each had a manual actuator, with all of them linked together via wires and pulleys to a control box located just outside the Winch Room. Once operated the CO2 suppressant would have travelled via steel pipes to the two locations mentioned above. Whilst the CO2 Battery was an invaluable asset in the ships fire fighting equipment it would only have been used in the most extreme of situtations, after all attempts had been made to fight the fire with portable extinguishers and under a strict operating and safety regime. CO2 is the most toxic gas when it comes to human health, and is a highly suffocating gas. With a concentration of as little as 9% into the confined atmosphere it could render a person unconscious within minutes. Though it provides a perfect smothering effect, the condition does not last for a long time. In case of non-continuous supply of CO2, chances of re-ignition increase if oxygen is re-admitted to the compartment too soon after the fire.